Membership of the club allows you to book a court without any additional fees. After completing a beginners' course, you will be invited to join the club at a reduced rate for the first year. You may also wish to come to club afternoons and/or evenings, at which players are matched up and allocated a court to play a singles or doubles game. Additionally, for the first year, you may also use a club mallet free of charge. There are no extra fees. *Near Country Member: A person living between 15 and 75 miles by road from the club. At the Committee's discretion, this includes people who live within 15 miles, are full members of another croquet club, and have nominated that club as their main club to the Croquet Association. **Far Country Member: A person living over 75 miles by road from the club. 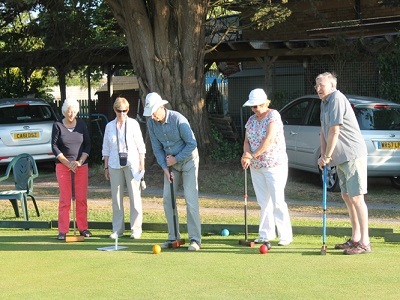 At the Committee's discretion, this includes people who live between 15 and 75 miles, are full members of another croquet club, and have nominated that club as their main club to the Croquet Association. After having joined, your annual subscription is due to be renewed in advance of the Annual General Meeting. This is normally held in early March, a few weeks before the season starts, however a discount is offered if paid before 31st December (approximately three months before the season starts). Court bookings are managed using an online Diary Booking System (DBS). To use the booking system, you will need a Google account - they are free and it's easy to create a Google account. You may not book a court on a club afternoon or evening, nor if a match or tournament is scheduled on that day. All other times are available. You may book a court (or a half court up to 31st May) for a morning, afternoon, or evening session, by entering your name in the relevant place.